Several factors come into play when choosing a motorcycle to fit you the best. Most of them are fairly obvious. If you’re quite tall you’ll be looking at ones that are taller and longer while smaller riders will lean towards ones with a shorter overall length and seat height. Knowing your personal limitations and preferences are key, especially if you’re a bit out of the ordinary. Along with me in the same group of test pilots were a mixed bag of people I didn’t know consisting of many different builds and sizes. As always I spoke to each of them about their choice of ride that day with great interest, because I’m a bike nut and a little nosey. One fellow stood out immediately to me. He only stood about 5’9” but must have weighed 300+ lbs with the bulk of it housed in his upper body and shoulders. I would guestimate his legs’ inseam at no more than 27 inches, but his arms were unusually long. He reminded me a lot of the bulldog characters out of the Looney Toons cartoons I watched as a kid. Bulldog lined up beside the Triumph Daytona 675R sportbike and chattered excitedly about getting to ride the newest version of his favourite bike! He was pumped up!… in many ways. 2) ride comfortably for any amount of time with so much weight pushing down on his wrists due to the Daytona’s extremely sporty riding position. The picture above approximates roughly what a 5’9” “bulldog” would have sat like if he was of average weight and arm length on the same Daytona 675R. Not a pretty sight is it? While riding it he looked a bit to me like a giant grizzly bear at the circus riding around on a tricycle. All he was missing were a handful of balloons and a funny hat. It turns out he did just fine on our 30 minute ride with no complaints at all. Just the opposite since he gushed about how much fun the bike was! I quizzed him in disbelief about the riding position afterwards. He explained his higher weight squatted the suspension down enough for him to reach the ground comfortably when stopped. Additionally, his upper body had such a large surface area for the wind resistance to act on it meant very little weight would act on his wrists while riding at speed. His unusually long arms also allowed him to sit more upright than the 45 degree angle most other riders would be subject to of the same size. Bulldog had been riding long enough to have this insight about himself and had found a way to enjoy sport bikes against all odds it seems. I’ve had other riders tell me they’re very comfortable riding long distances in a tucked sport position as well, but I suspect they are the exception more than the rule. I’ll be looking at what is the general rule when it comes to most people in this article. If you’re far from average then you’ll have to take what I have to say with a grain of salt. Regardless of your body type and size you’re going to want to remember to grip the frame of the bike while riding with your thighs on and off to give yourself better stability and to take the weight off your other extremities occasionally while riding. The “Standard” or “upright” riding position is generally accepted as being the most comfortable one on average across all shapes and sizes of riders because it’s a neutral one. It places the least strain on any joints and places the spine in a natural position of rest. 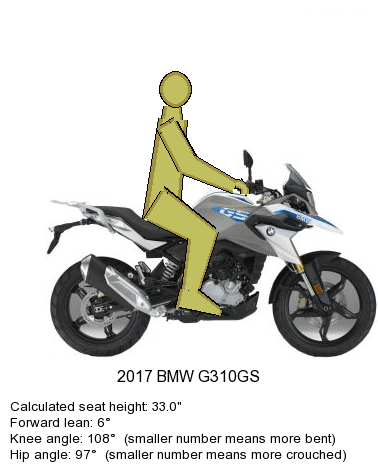 The BMW G310GS illustrates this neutral position very well. This is the same 5’9” rider with a 27 inch inseam I used before on the Triumph Daytona sitting astride it. 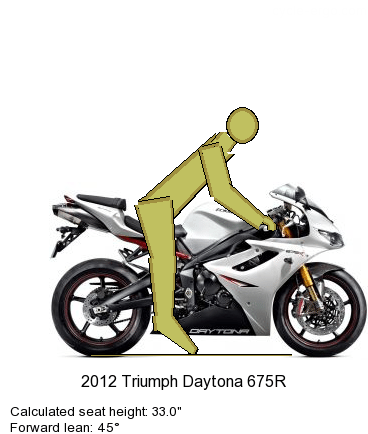 There’s quite the difference in lean angle forward, knee and hip angle compared to the Daytona. In the Standard Position the hands are set a little lower than the elbows allowing blood to circulate freely through all appendages relatively well. You’ll find the further you stray from this position the more “hot spots” will show up on your body relative to time spent in the saddle. Most people should be able to ride the longest comfortably in the Standard riding position as such. The 33 inch seat height on this BMW will mean the rider will have some trouble putting their feet down flat when stopped, but this can be remedied or helped at the least by installing a lower seat or even a lowering link in the suspension to bring things down. If you’re a taller rider in the 6’2 and up range you’ll likely want to install handlebar risers even on a standard position bike because your torso will be taller and your arms longer. The risers will compensate for that and return you to neutral. 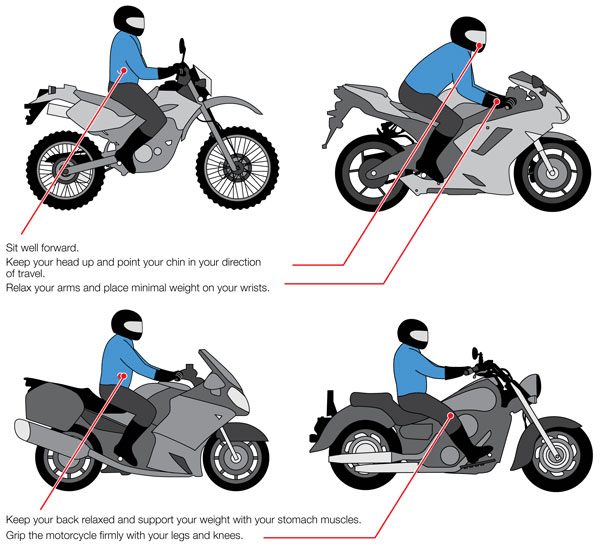 These measures can be used on most every motorcycle on the market to some degree. To some degree I prefer the Cruiser position for long rides more than the standard because I enjoy stretching my legs out forward more than the standard foot peg location demands. There is the option of installing highway pegs on a standard bike to allow you to have the same place to stretch out if you like. Cruisers also tend to have higher handlebars in general. Sometimes for show in the case of exaggerated “ape hanger” styles, but mostly at a very comfortable height. 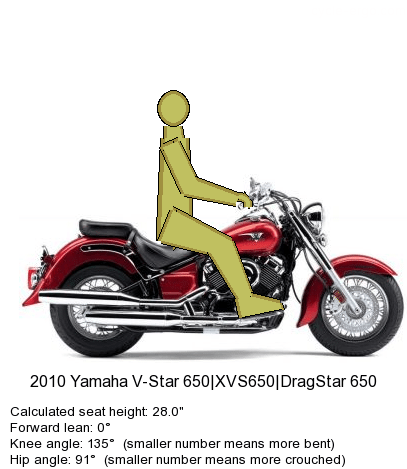 The Yamaha V Star 650 illustrates this position well for the same sized rider. If they slid back a little in the seat it would straighten out their legs a bit more too, which I personally find more comfortable on long rides. You want to avoid legs being totally straightened out as it’s difficult to reach your shift and brake levers and still have good control. It also makes it harder to balance the bike when riding at slow speeds, especially in turns. The same applies when reaching for your handlebars. Having your arms slightly bent is what you’re after ideally. You can often adjust the angle of the bars to accommodate shorter or longer arms if need be. The tucked sport position can be comfortable on shorter rides and provides great control of the bike when travelling at high speed. Obviously so because it’s the one used in MotoGP after all. 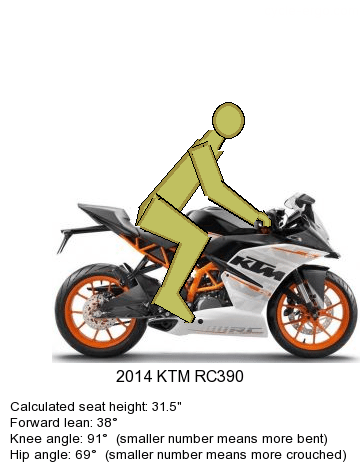 One big difference is where your feet are placed on a sport bike. The footpegs will be mounted farther back and higher up than the other two riding positions to allow the bike to be leaned over as far as possible when going fast through a corner. It’s great for racing, but hard on the body when riding a long time. Most beginner sport bikes won’t be as aggressive as the supersport models are thankfully. As a learner you want to spend plenty of time in the saddle. The Honda CBR300R is a great hybrid sport position. It’s still sportier than standard with a 25 degree forward lean angle but the footpegs are lower and more forward giving a knee and hip angle similar to the Standard one. This KTM RC390 is more aggressive with its forward lean and hip angle. The hip and knee angle being more pronounced will inhibit blood flow and lead to numbness much more quickly in the lower body and backside. Width: If your inseam is short another important factor to consider is the width of the bike across the saddle area. Some cruisers, like Harley Davidsons are quite wide across there and can even make a low seat height of 28 inches seem harder to work with. Weight: A heavier bike will be a handful regardless of seating position, but becomes even more pronounced if you’re having trouble reaching the ground or the controls. It’s a recipe for disaster and should be avoided in a beginner bike if possible. Seat: I believe KTM has almost single-handedly built the aftermarket seat economy based on the two bikes I’ve owned from them. It’s like having a mad dog chew on your backside after about an hour riding it and that’s no exaggeration sadly. Unfortunately just sitting on a bike in the showroom for a few minutes won’t really tell you this. It can feel fine in the short term and turn ugly later. What you’re looking for is a flat and wide perch that isn’t overly firm or soft to land on. That gives you the best chance at comfort on the bike. In a lot of cases (even other than KTM) you’ll want to opt for an aftermarket offering to calm the pooch living in your seat. A different seat or adjusting the stock one gives you the opportunity to lower or raise the height to better suit your needs too. Win/win other than the added expense. The seating positions I’ve used in this are from a fantastic simulator found online at http://cycle-ergo.com/. 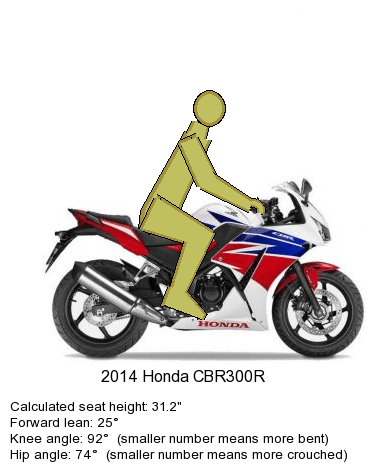 You can plug in your personal statistics (height and inseam measurements) to see roughly how you’ll fit many different motorcycles on the market. Very useful indeed if you can’t find a particular bike in your area and are curious about fit. Most important is to try before you buy when it comes to finding the best sized motorcycle for your unique build. Not only is it a great excuse to enjoy the vast selection out there, but you just might learn something about yourself in the process. Hopefully it’s not that you’re built like a cartoon character, but even if you are there’s still a bike out there to fit you.